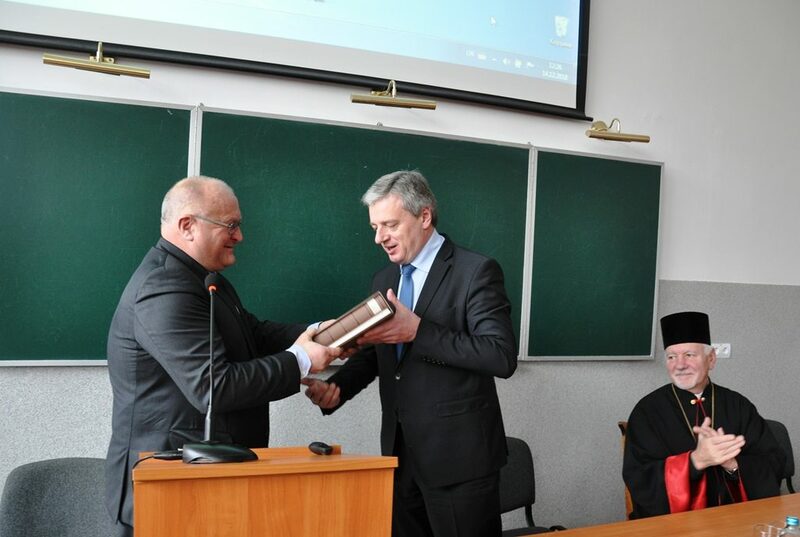 At the Vasyl Stefanyk Precarpathian National University there was held a presentation of a facsimile edition of the Galician Gospel of 1144 the other day. The edition was introduced into the world owing to the hard work of the Church, the university scientific workers and the Ukrainian Catholic University. The solemn presentation was held with the participation of the principal of the university, professor Ihor Tsependa, the archbishop and metropolitan of the Ivano-Frankivsk Ukrainian Greek Catholic Church Lord Volodymyr Viytyshyn, the head of the “Galician Gospel dated by 1144” project Ihor Oliynyk, the Dean of the Faculty of Humanities of the Ukrainian Catholic University, doctor Andriy Yasinovsky, the principal assistant , professor Ihor Skochylyas, other professors and university teachers and students. The principal of the Vasyl Stefanyk Precarpathian National University highlighted the importance of keeping the traditions of the nation, the national heritage and expressed his gratitude for the common work on the project by both universities. The archbishop and metropolitan of the Ivano-Frankivsk Ukrainian Greek Catholic Church also gave his thanks for assisting in publishing the edition which is believed to enrich the heritage, the history, to help understand the church.